On Nov. 1, 1992, a Clinton-Gore campaign poster in patriotic red, white, and blue stood tall just outside of Thayer Hall in Harvard Yard. The battle played out throughout the freshman dorms. In neighboring Canaday A, one campaign poster was surrounded by several signs reading “Not!” in other windows. "My roommate put up a Bush-Quayle sign and the rest of us, who are more liberal, decided to put up the ‘Not!’ sign. We finally convinced the people above us and our proctor downstairs to put up ‘Not!’ signs also," Tai U. Truong '96, a Clinton supporter, told The Crimson in November of 1992. This sign war swept Harvard’s campus in the days and weeks leading up to the presidential election of 1992, a visual tribute to students’ deep yet spirited investment in the campaign season. For many students, it was the first time in memory that a Democrat had a real shot at the White House. “I was three or four years old the last time a Democrat had been in office so it was, for a lot of us, the first time that we had hope that somebody that we believed in, you know, would become president,” Manuel S. Varela ‘94, who was president of the Harvard College Democrats at the time, recalled. Varela said he closely followed the campaign with his peers during his time at the College. Members of the Class of 1993 attended Harvard as major geopolitical shifts played out abroad. Their college years saw the end of the Cold War, a recession following the economic expansion of the ’80s, and the Gulf War. Despite lighthearted sign battles, Harry J. Wilson ’93, who was president of the Harvard Republican Club at the time, recalled the Gulf War as one of the few points of real political tension on campus. “While the debate around the Gulf War was quite charged, it was relatively brief, with much less campus controversy during much of the rest of our time at Harvard. The Republican Club surged in membership, at one point having over 500 members,” he wrote in an email. He noted that these tensions manifested themselves in peaceful forms of protest. “There were active but totally peaceful anti-war AND pro-troops organizations and rallies,” he wrote. Varela said the Gulf War motivated students to participate in the 1992 campaign season. Many students volunteered to work for campaigns in neighboring New Hampshire, a more competitive state than deep-blue Massachusetts. In the days leading up to the election, liberals and conservatives voiced their opinions on campus. Fortunately, political divides didn’t seem to get in the way of personal relationships. “We all got along and we actually would sort of laugh about our disagreements,” Varela said. Livia M. Santiago-Rosado '95, who fought a battle of signs with her roommate leading up to the election, told The Crimson in 1992 that though their political differences didn’t create tension, they didn’t prompt much discussion, either. "We don't really talk politics much. There's no point in it—we're not going to change each other's mind anyway,” she said at the time. A 1992 Crimson article features students looking ahead to the 1996 election after Clinton's win. But when the results came in, some conservative students were left licking their wounds. "We're dying in here. 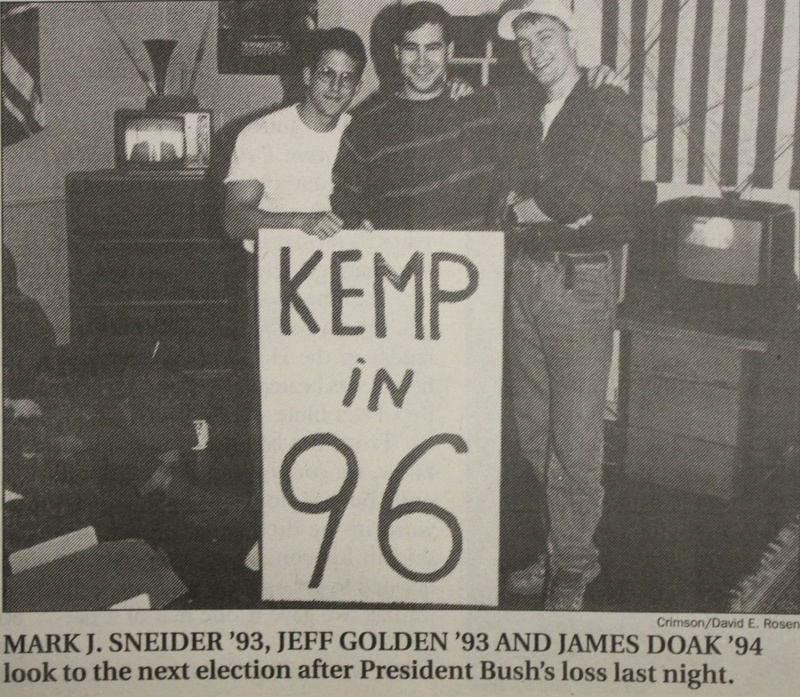 I feel like I'm bleeding," Mark J. Sneider '93 told The Crimson while hosting a “Bush commiseration party” in his room in Eliot just moments after his candidate’s defeat. "Denial. Anger. Betrayal. Depression. Acceptance. I plan to go through all five tonight," Fred A. DeCaro III '93, then secretary of the Republican Club, said at the time. Wilson, however, who penned Crimson op-eds throughout the campaign, said Bush’s candidacy failed to generate enthusiasm among several campus Republicans. Former Dean of the Kennedy School Joseph S. Nye was somewhat surprised at Clinton’s election. “Bush was an incumbent and many people thought that Clinton was running in ’92 to prepare for ’96,” he said. The year was an unusual one for presidential politics. Ross Perot, an independent candidate and business magnate, garnered almost 20 million votes, which was close to one-fifth of the electorate. Nevertheless, many on campus were overjoyed to be celebrating the election of the first Democratic president since Jimmy Carter in 1977. That evening, around 40 Clinton supporters toasted to the Democrats’ victory in Harvard Square favorite Charlie’s Kitchen. “I think everyone was watching the inauguration and was really excited about what was coming,” Varela said. 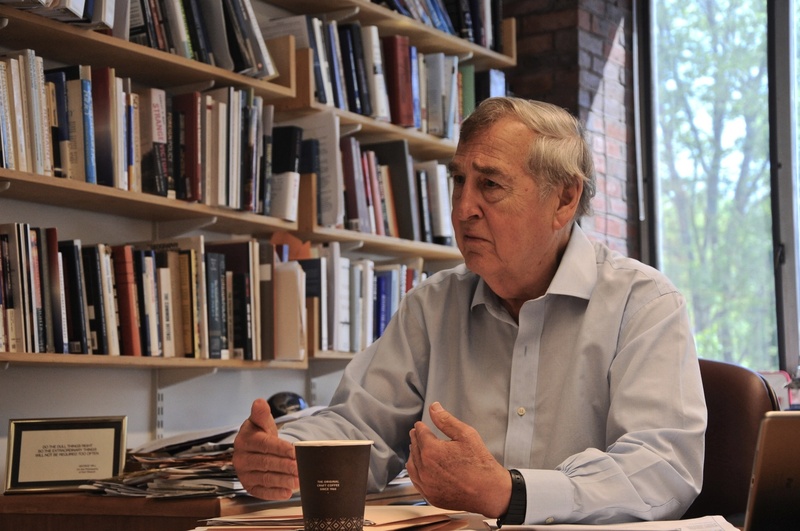 Graham Allison reflects on the Clinton era in his Harvard Kennedy School office. If Harvard students and faculty had been the only ones to vote for the 42nd president, Bill Clinton likely would have trumped Bush and Perot with ease. “In 1992 you would’ve had—it was still predominantly Democrat, but you would’ve had probably a quarter of the faculty and students who would identify themselves as Republicans or conservatives,” said Kennedy School professor and former Assistant Secretary of Defense Graham T. Allison. With a Democrat finally in the White House, several professors traded Cambridge for Washington the next year. Clinton started tapping Harvard professors to join him in Washington from day one. “The day of the inauguration, [Clinton] told me to come see him and he said, ‘Graham, you’ve been writing about nuclear weapons in the former Soviet Union and what’s going to happen to them, so I’m going to appoint you to be assistant secretary of defense, and you’re going be responsible for all the weapons left outside of Russia,’” Allison said. Allison would serve as Clinton’s Assistant Secretary of Defense from Aug. 1993 through March 1994. And though Allison intended to return to Harvard eventually, he said he was in no rush. “If you’re in something like the Kennedy School, and you care about issues passionately, and you think you understand the issues, and you think you have some ideas what to do about them, then the opportunity to go and be part of the doing of it is like a pig in manure,” he said. Other Harvard professors that left to work in the Clinton Administration included Kennedy School Professor Mary Jo Bane, who was appointed to a high-ranking position in the Department of Health and Human Services, and Nye, who would serve as an Assistant Secretary of Defense. Clinton also tapped Kennedy School lecturer Robert B. Reich to be his Secretary of Labor. Bane said Clinton’s team actively searched for scholars of public policy, especially at institutions like Harvard. 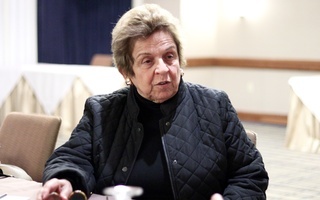 Allison noted, however, that working in government was, at times, more challenging than theorizing about it. “It’s so much easier to think of something by writing it down on a piece of paper than causing it to happen,” he said. Though roughly a dozen professors departed Cambridge for Washington in the spring of 1993, students at the College weren’t heavily affected by the sudden departure of faculty. “I wouldn’t be able to name anyone, at least any of my professors, that had left,” Varela said. 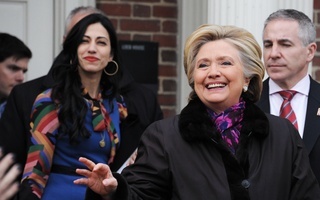 Clinton would maintain close links to Harvard throughout both of his terms, though his most famous nomination from Harvard, former University President Lawrence H. Summers, would not be tapped to be Secretary of the Treasury until 1999.